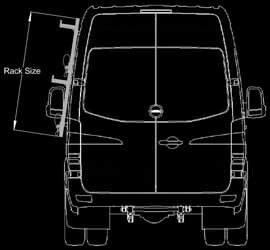 Ladder racks for Sprinter Van, ladder racks mount to the van side. Driving a Dodge, Freightliner or Mercedes Sprinter van? Getting ladders on and off the roof of an 8'+ high Sprinter van can be a difficult task, even on the best of days. Many service professionals are choosing VertiRackTM side mount ladder racks to ease and speed up the time of their service calls. VertiRackTM Vertical Ladder Racks mount to the side of Sprinter high roof vans, greatly improving ladder accessibility. Not only does VertiRack's side mount ladder rack speed up the ladder loading and retrieval process, it also keeps service personnel from having to climb the van, eliminating dangerous slip and fall accidents. VertiRack's anodized aluminum and stainless steel Sprinter van ladder racks are built to last a lifetime, while costing only a fraction of the price of drop down ladder racks. VertiRackTM makes 1 and 2 ladder Sprinter ladder racks. Available to fit both 2007 and newer Sprinter Vans as well as pre-2007 Sprinter Body styles. 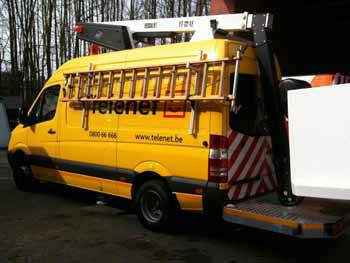 Call for pre-2007 Sprinter ladder racks. 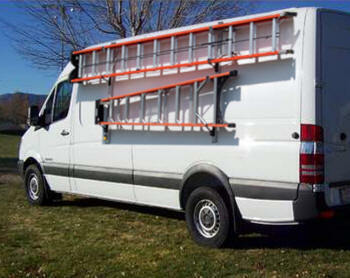 Please inquire for other Sprinter van ladder rack sizes or styles. VertiRackTM Vertical Ladder Racks are available to fit the high roof Sprinter Van. 2007 and newer Sprinter service vans. VertiRackTM Ladder Racks for the Sprinter Van offer superior design for ultimate convenience.